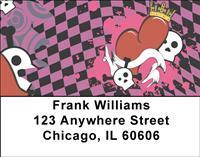 Your checkbook will positively shout with these explosive skulls and hearts! Nobody ever said that your personal checks had to be boring and they definitely won't be when you carry these unique and powerful designs. Four rotating images mean that every check will differ from the previous one. It's time to show your passion!